Is the weather not cooperating for an outdoor campfire? 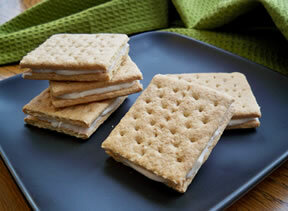 Bring a little flavor of a campfire treat indoors. These are easy and can feed a crowd. In a saucepan on the stovetop, boil the corn syrup, butter, and chocolate chips. Remove from heat and stir in the vanilla. 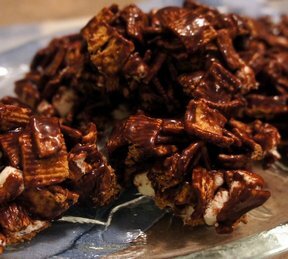 Pour the Golden Grahams in a large mixing bowl; then pour the warm chocolate mixture over the golden grahams and stir. Add the marshmallows one cup at a time and mix well. Before the mixture cools, empty it into a large jelly roll pan and smooth it out. 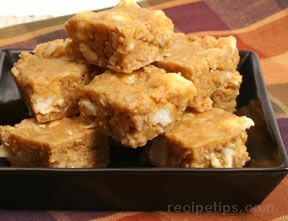 Refrigerate; then cut into squares. Note: If your jelly roll pan isn't large enough to hold the entire recipe, pour the remainder into a second pan. 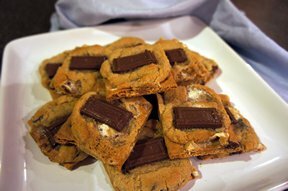 "These were a crowd pleaser, but I think I would have liked them better with milk chocolate chips. And I would add a couple more cups of marshmallows."